At the end of July 2018, Onformative present a new audiovisual art installation at Funkhaus Berlin’s Sound Chamber. 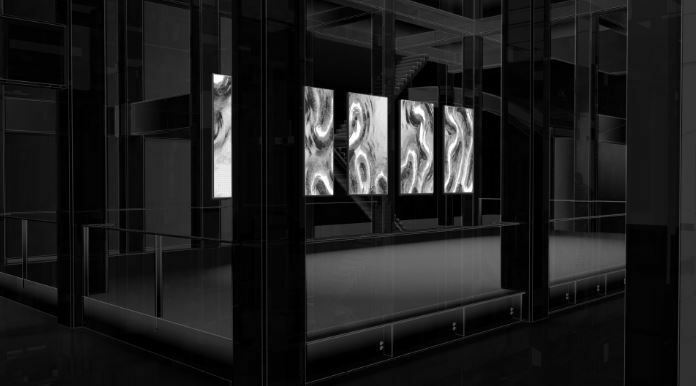 Meandering River is a large scale installation occupying multiple screens in the Sound Chamber. Visuals by onformative interact with a sound composition by kling klang klong. The newly developed work is a digital visualisation and sonification of the properties of rivers and water. Complex flows, ebbs and surges are rendered using pixels and bytes - parcels of data are arranged so as to generate unpredictable currents. Meandering River is an insight into onformative’s digital design process, which regularly crosses borders from digital to physical, technical to natural, procedural to philosophical. The work takes the visitor on an emotional and conceptual journey as the digitised liquid is contained, spills over and makes channels. The artwork foregrounds the unpredictability of change, the openness and interconnectedness of water systems, and the power of water over life.